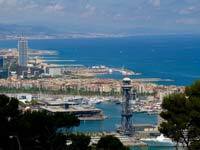 Located on the coast of the Mediterranean and home to 1.6 million, Barcelona is one of the great European cities. 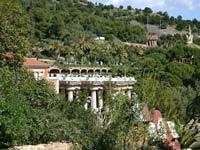 It is the capital of Catalonia, was home to Picasso, Miro and Gaudi, and hosted the 1992 Olympic Games. Those visiting Barcelona will enjoy its great year-round weather (with average temperatures of over 23 degrees Celsius between May and October), fantastic food (think tapas, fresh seafood and the nearby El Celler de Can Roca—voted the world's second best restaurant), interesting museums (we recommend the National Art Museum of Catalonia), colourful architecture (for example at the Park Güell and the Sagrada Familia) and atmospheric public places (ranging from the Nou Camp stadium, to La Rambla, to the Waterfront). 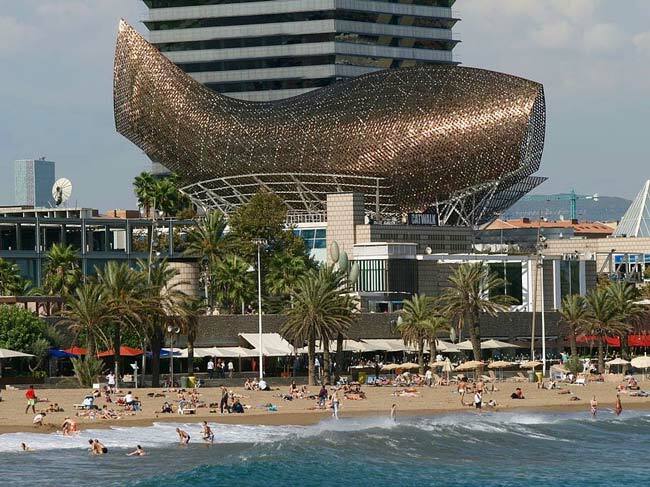 Here are Barcelona's best attractions and things to do. The Sagrada Família (aka the Church of the Sacred Family or Templo Expiatorio de la Sagrada Familia) is a large, part-built Roman catholic church designed by Antoni Gaudí. The Pyramid, 756 feet wide and 481 feet high, is the largest of three principal pyramids at the Giza Necropolis. It was built by 100,000 men between 2580 and 2560 BC using over 5 million tons of limestone. The largest blocks, transported from Aswan (over 500 miles away) weigh about 80 tons. Construction started in 1882 and is not expected to be completed until 2026, though part of the structure has been open for public worship since September 2010. 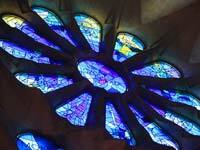 The Sagrada's distinctive and idiosyncratic design have made it one of Spain's top tourist attractions. 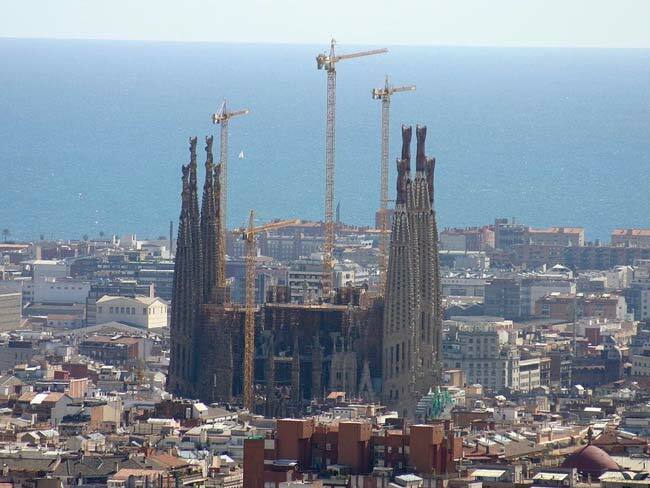 Gaudi lived from 1852 till 1926, and devoted the last 15 years of his life exclusively to the Sagrada; when asked about the long construction period, he is said to have replied: "my client is not in a hurry". 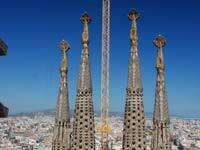 The Sagrada will have a total of 18 towers, one for each of the twelve apostles, the four Evangelists, the virgin Mary, and Jesus Christ. The scale of the Sagrada is massive: it has five 90 metre naves and a 'crossing' with three naves, which together form a Latin cross. where? Sagrada Familia, Placa Sagrada Família, 08013 Barcelona. Closest metro: Sagrada Família (Blue Line, L5 and Purple Line, L2). when? Oct to Mar 9am to 6pm; Apr to Sept 9am to 8pm (9am to 2 pm on 25/26 Dec and 1/6 Jan). £$€¥ Adults: €13.50 to enter the part-finished church (concessions €11.50, children under 10 free), €2.50 to take an elevator to the top of one of the towers. 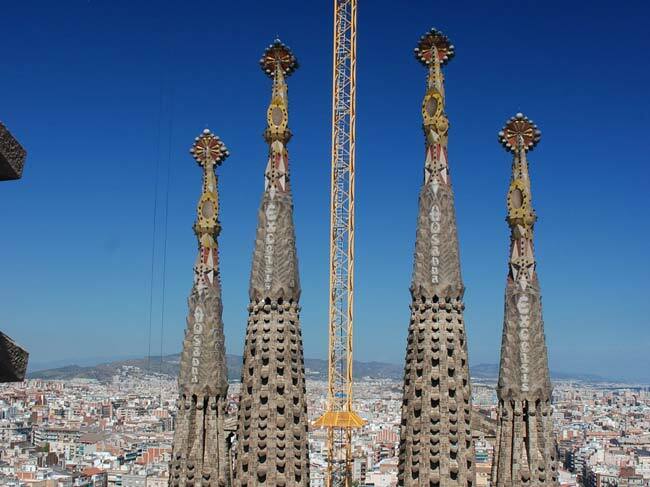 Whilst many consider the entrance fee to be expensive, the monies raised are spent on the Sagrada's completion. 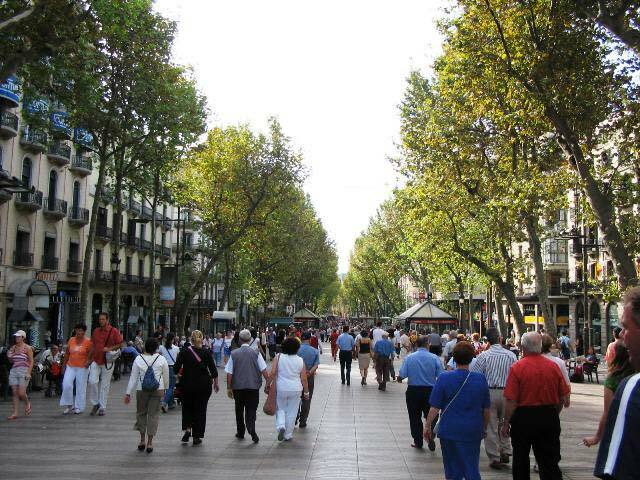 La Rambla (aka Las Ramblas) is a 1.2 kilometre tree-lined pedestrian street in central Barcelona. it is the place for street entertainment (there are usually a number of convincing human statues towards the street's harbour end). 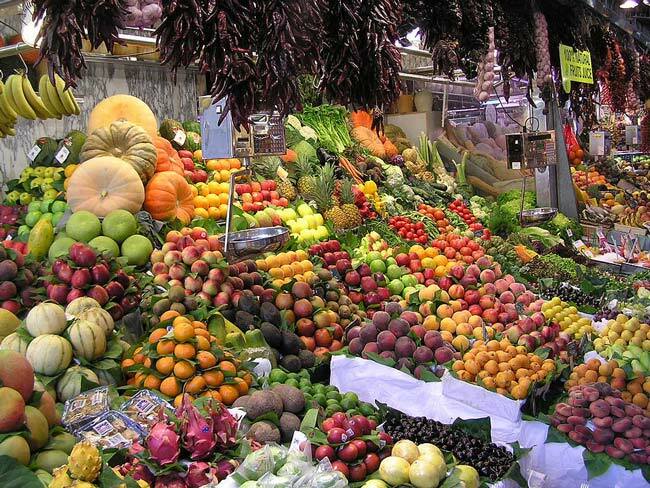 The street becomes crowded at peak times and is also a hunting ground for local pick-pockets. But walking from Barri Gòtic to the Christopher Columbus Monument, erected in 1888 as part of Barcelona's Universal Exposition and standing 60 metres tall, is a great way to soak up the city's atmopshere and get your bearings. where? 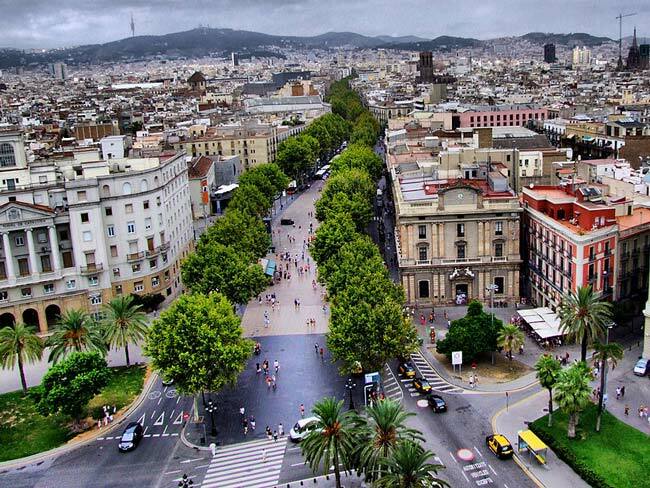 La Rambla is made up of a number of streets: Rambla dels Estudis, Rambla de Sant Josep, La Rambla and Rambla dels Caputxins. Closest tube Liceu. when? All day, every day. 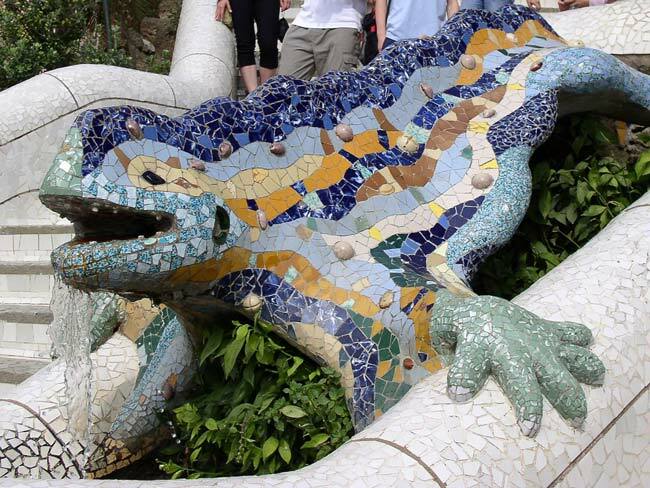 Park Güell, often said to be Gaudi's most colourful creation, is a garden complex designed by Gaudi situated on the hill of el Carmel in Barcelona's Gràcia district. Although the Park was initially intended to contain a number of public buildings and houses, many of the buildings failed to become reality. 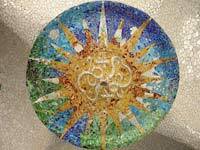 What is left is a wonderfully quirky public space that contains vibrant stone structures and mosaics. On entering the Park, visitors will meet a beautifully mosaiced stone dragon (pictured). As they ascend the Park's central stairs, they will encounter the Room of a Hundred Columns (a cavernous market hall with 84 crooked pillars and a number of mosaics). At the top of the central stairway is a large snaking balcony with panoramic views over the city, together with a 500 foot mosaiced bench. One of the buildings close to the Park's entrance has been converted into a museum, housing Gaudi furniture and drawings. where? 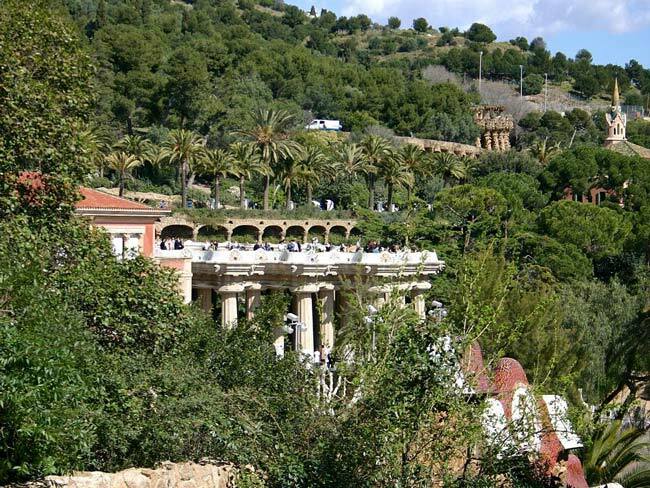 The closest metro stop to Park Guell is Lesseps (Green Line, L3), though the Park is still a 20 minute walk away (the last 200 metres of which are up a steep hill). when? 10am to around 7pm (closing times vary). The National Art Museum of Catalonia (aka Museu Nacional d'Art de Catalunya or MNAC), housed in the Palau Nacional, is home to Europe's finest collection of Romanesque frescoes. The Museum's romanesque gallery displays mainly Catalan works from the 11th to 13th centuries. 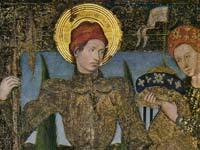 The most important works are the murals that have been transferred from Catalonian churches and chapels (including the interior of Sant Joan de Boí and murals from the Sant Climent and Santa Maria de Taüll). 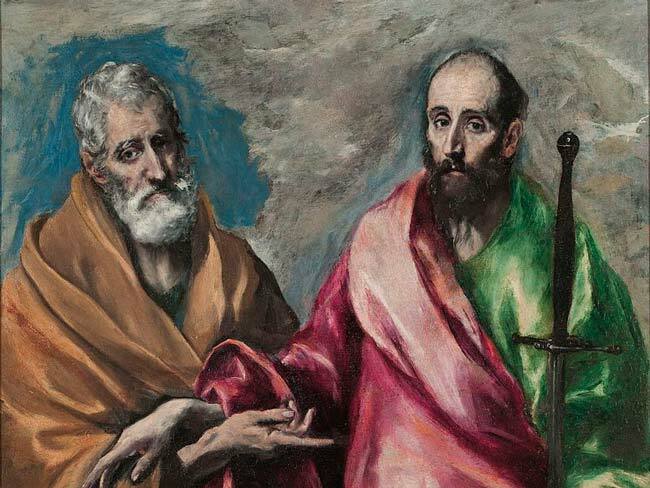 The Museu also displays art from the gothic, renaissance, baroque and modern periods, together with drawings and prints, photographs and coinage. The modern art collection includes works by Casas, Rusiñol, Nonell, Gargallo, Gaudí and Picasso. where? 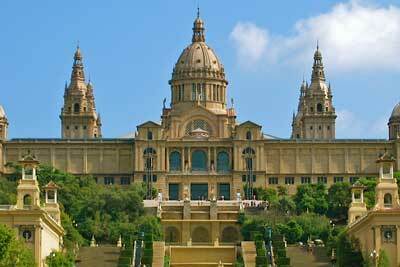 National Art Museum of Catalonia, Palau Nacional, Parc de Montjuïc, 08038 Barcelona. T: +34 93 622 03 76, E: mnac@mnac.cat. Closest metro is Pl. Espanya (lines L1 and L3). when? Tues-Sat: 10am to 7pm; Sun: 10 am to 2pm; closed Mon (except public holidays), 1 Jan, 1 May, 25 Dec.
£$€¥ €8.50, but free for under-15s and over-65s. 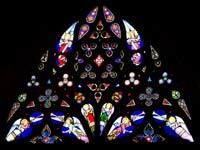 Free on first Sunday of the month, 18 May, 11/24 Sept. Various concessionary tickets are available for youths, the unemployed and families. 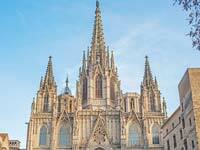 Construction of Barcelona's gothic cathedral (aka Cathedral of Santa Eulalia) stared in 1298 and was not completed until 1913. 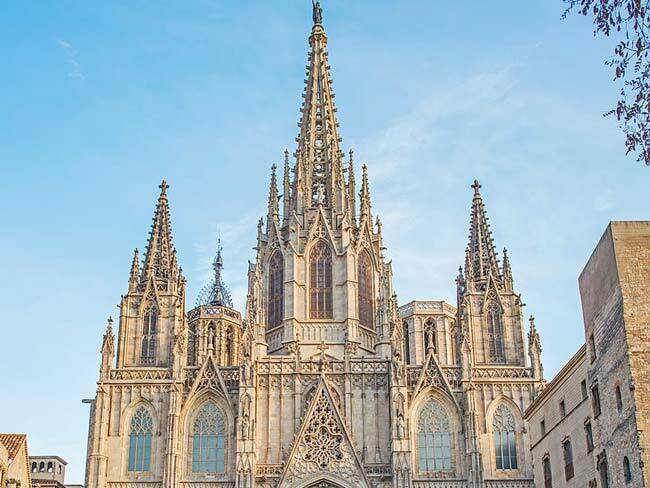 The cathedral is dedicated to a young virgin named Eulalia of Barcelona, one of the patron saints of Barcelona, who (legend has it) suffered martyrdom under Roman rule. The cathedral has a 230-foot high main facade, a vaulted ceiling supported by 85-foot high columns, 28 side-chapels, a secluded cloister (where 13 white geese are kept—because Eulalia was 13 when martyred), and twin octagonal bell towers. 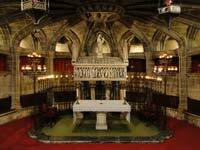 Also worth a look are the Cathedral's intricately carved choir stalls, which bear the painted coats of arms of several European monarchs, and the Cathedral's crypt, beneath the main altar, which holds Santa Eulalia's sarcophagus. where? Barcelona Cathedral, Plaça de la Seu s/n, Barri Gotic, Barcelona, Spain. Tel: 93 315 15 54. Metro: Jaume I.
when? 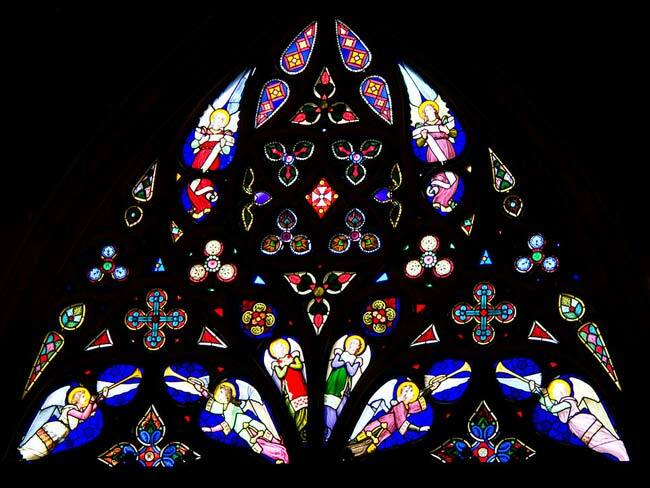 Cathedral: 9am-1pm and 5-7pm (7 days a week); Cloister museum: 10am-1pm and 4-6.30pm (7 days a week); Roof: Mon-Sat 10.30am-1.30pm and 5-6pm. £$€¥ Entry to the Cathedral is free. €1 for entry to the museum, and €2 for access to the Cathedral's roof. At the far end of Las Ramblas is found the Columbus Monument (aka Monument a Colom), built for the 1888 Universal Exhibition at the spot where Columbus stepped ashore in 1493 after discovering America. 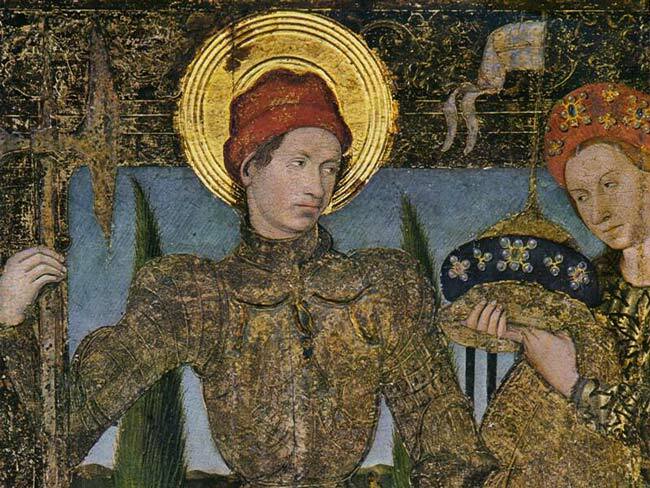 Columbus brought back six Caribbean Indians who were subsequently converted to Christianity. Visitors can climb to the top of the 200-foot monument, from where the revitalised port to the left (east) can be viewed. 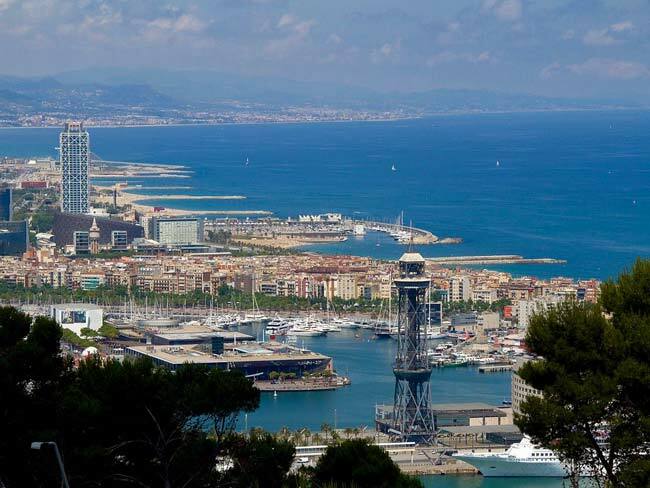 After taking in the Columbus Monument, head left to Barcelona's Marina (aka Port Vell) by crossing the Rambla de Mar pedestrian bridge. The Port contains a new shopping and restaurant complex, an IMAX cinema and the largest aquarium in Europe (with 8000 fish and 11 sharks contained in 6 million litres of sea water). 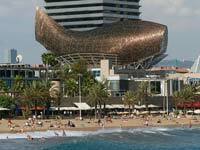 Continue along the waterfront to the Port Olímpic, rebuilt for the 1992 Olympics hosted by Barcelona. The Port is a wonderful place to eat out. Then continue along the waterfront to find a string of sandy beaches, edged by a palm-lined boardwalk. where? 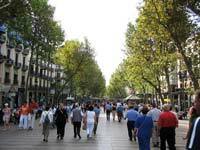 Start your tour of Barcelona's waterfront from the bottom of Las Ramblas (the closest tube is Drassanes). when? 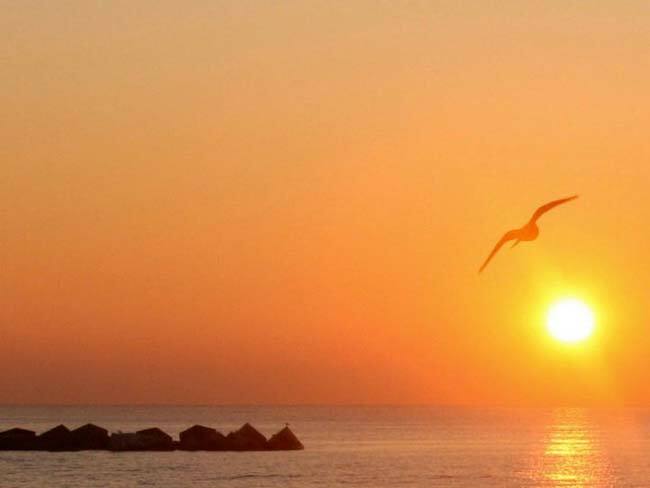 Afternoons and evenings are the best time to take in the waterfront's atmosphere. 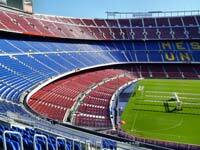 The Nou Camp (aka Camp Nou) was constructed in 1957 and is the home to FC Barcelona. 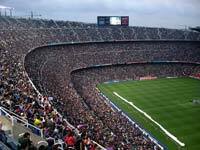 It has a capacity of 98,787 spectators, making it the 10th largest stadium in the world. The Nou Camp hosted the inauguration ceremony for the 1982 world cup, after which Belgium beat Argentina 1-0, and the 1999 Champions League Final, when Manchester United beat Bayern Munich 2-1. The Nou Camp also regularly holds concerts, with U2, Frank Sinatra, Madonna and Michael Jackson all having performed here. In 1984, the Stadium's El Museu del Barça was opened. 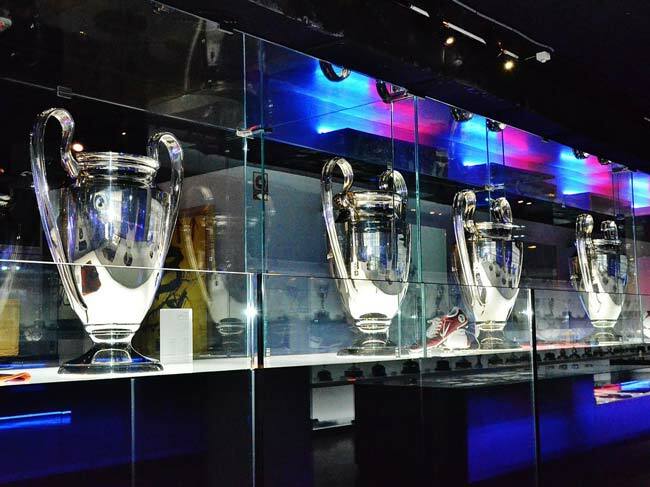 That Museum houses 420 of FC Barcelona's trophies, and regularly attracts over 1 million visitors a year. 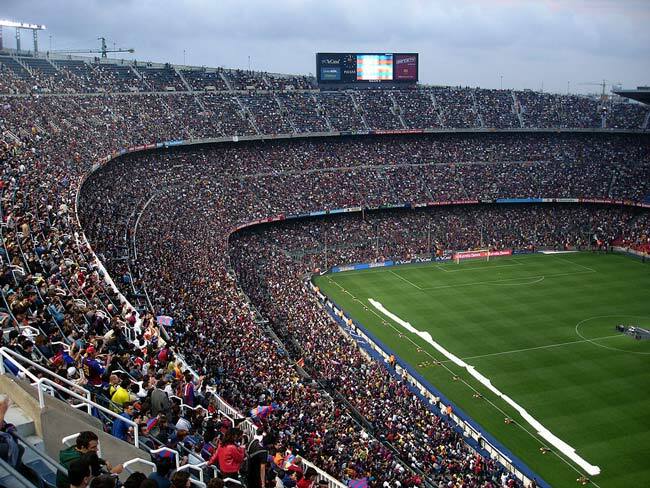 In 2007, British architect Sir Norman Foster was selected to remodel the Nou Camp, at a cost of over €250 million, and to increase capacity by 10,000.
where? Av.Artístides Maillol, s/n 08028 Barcelona. Metro: Line 3 (to Maria Cristina or Les Corts) or line 5 (to Collblanc or Badal). when? Mon to Sat (between April and Sept): 10 am to 8 pm on Mon to Sat (10 am to 2.30pm on Sun and Public Holidays). For the rest of the year, opening hours are 10am to 6.30pm Mon to Sat (10 am to 2.30pm on Sun and Public Holidays). 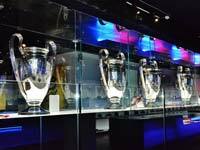 The museum closes early on match days, and is closed on 25 Dec, 1 and 6 Jan.
£$€¥ Combined museum and Nou Camp tour tickets cost €17 for adults and €14 for children under 14 and concessions. 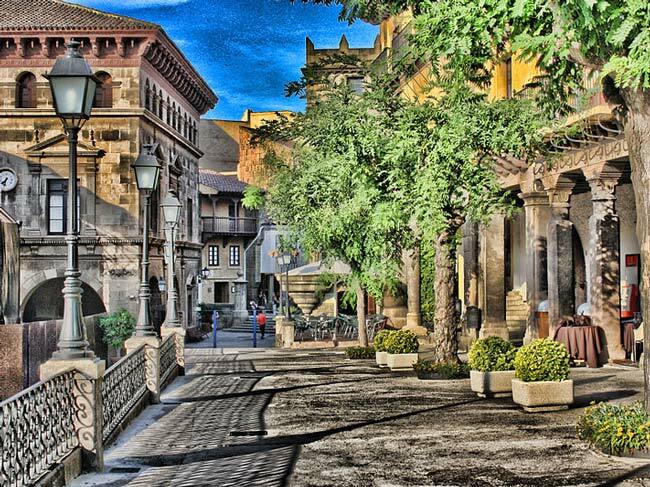 The Poble Espanyol was initially designed as a temporary exhibit for the 1929 International Exhibition, to illustrate and display Spanish architecture and crafts. 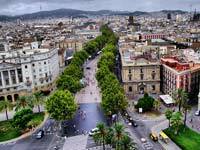 It contains 117 buildings, streets and squares radiating out from the Poble's main square, designed by well-known architects and artists of the age. 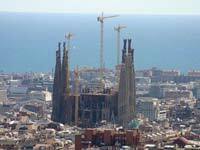 There are examples of buildings from Catalan, Madrid, Andalucia, the Basque and the Balearic Islands. 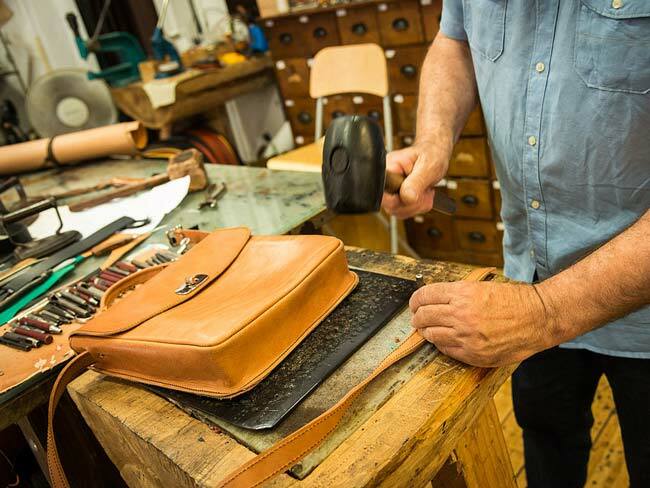 In addition to the architecture, the Poble is well-known for its resident artisans, who, working in the Poble's open-air museum, produce crafts including hand-blown glass, ceramics, embroidery, carvings, Spanish guitars and Catalan sandals. 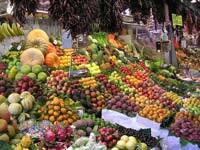 The Poble is also home to a number of restaurants and two discotheques. where? 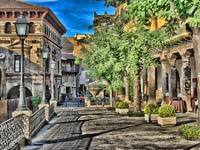 Poble Espanyol, Avinguda del Marquès de Comillas. The closest metro is Espanya. when? Mon: 9am to 8pm; Tues to Thurs: 9am to 2am; Fri: 9am to 4am; Sat: 9am to 5am; Sun: 9am to 12am. The craft shops are open between 10am and between 6pm an 8pm depending on the season. £$€¥ Adults €8.50, Children (4-12 yrs) €5.50, Students/Seniors: €6.50.